A Jello Shot that will make for a Berry Delicious Happy Hour! Spray your cocktail molds with a spray cooking gel. Drop 3 or 4 Fresh Berries into your chosen cocktail mold. In a medium saucepan, add the gelatin to the mixed berry fruit juice and allow to dissolve for a few minutes. Heat this mixture until the gelatin is completely dissolved - about 2 to 4 minutes. DO NOT BOIL. Turn off the heat, stir in the Berry Flavored Gelatin and stir until dissolved. Quickly add the cup of Berry Vodka. Pour the gel mixture over the fresh berries in the molds and allow to set in the fridge for at least 4 hours. 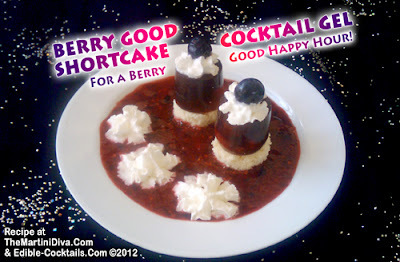 Make your Mixed Berry Coulis (recipe just below) and your Bisquick Shortcakes (recipe for shortcake mixture is on the Bisquick box). Follow the directions on the Bisquick box for the shortcake recipe BUT do not roll and shape shortcakes. Spread the mixture into the greased sheet cake pan about 1/2" deep. Bake at the box temperature but check every 5 minutes as this is thin and likely to bake much faster than regular biscuits or shortcakes. When this is cooled you will be cutting out shapes to fit the bottom of your cocktail gels. Yes, you can prepare this without cooking as well - the only difference is a slightly smoother texture with the cooked but a higher nutritional value with the uncooked. I lower the sugar content on the uncooked if my berries are sweet enough! Once your gels are set up, cut out a disc of the shortcake to fit the bottom of your gel, set the gels on top of these shortcake discs. Pour some of the Mixed Berry Coulis on your serving plates. Arrange 2 or 3 gels on each plate. Top the gels with whipped cream and a few fresh berries. 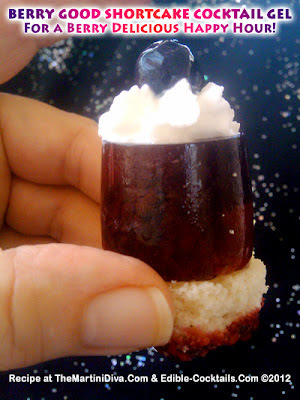 Add a couple of extra dollops of whipped cream for the leftover berry coulis. Serve with a spoon so your guest can eat the leftover coulis! Cookie cutters don't need to be heated and silicone molds do not need to be heated to release either - but don't forget the cooking spray before you pour your gelatin into any mold! Most cocktail gels can be frozen, depending on the ingredients. If you're preparing these for a party that will have children present create some without alcohol simply by replacing the liquor with the same amount of a non- alcoholic liquid or puree of a complimentary flavor, BUT be sure to make the non-alcoholic ones look very different from the ones with alcohol.